There is only one true Irvin and this is it. 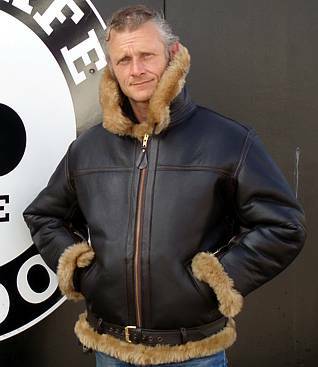 Aviation Leathercraft own the Irvin trademark and manufacture this genuine jacket here in the U.K. An Irvin label within each jacket confirms it’s authenticity. When those of us that were once small boys ran around, arms extended, making aircraft engine noises, this is the jacket we would have worn. In our mind’s eye, this jacket was synonymous with heroic derrind-do. If there is one item of apparel that sums up all that is best about the brave British tradition of mastery of the skies, this is it. Of course, the Irvin RAF Sheepskin Flying Jacket is practical: it’s made from first-rate, hard-wearing materials and it’s made with the same pedantic attention to detail demonstrated by its creator. It will last you virtually forever, but it’s not just about practical stuff- the Irvin jacket is a legend, it’s a part of a history, it has its place in our history and as much as anything else owning a genuine Irvin just feels right. You put it on and there’s no question that you’re part of something special. This jacket includes the exclusive Irvin label. Please note that larger sizes are available but are subject to a surcharge. Please email us using the “Contact Us” option above for larger sizes.